Great bathmat. Held up very well and did not hold any mildew. Not to mention it did not get slippery at all while in the shower. I would definitely recommend this mat. 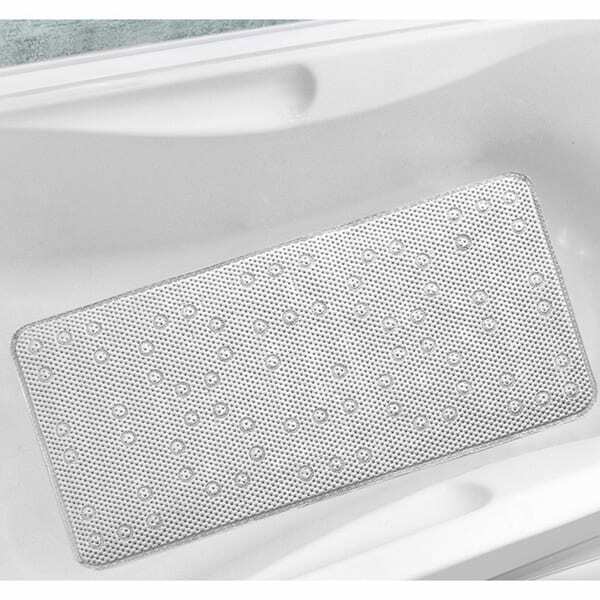 The anti-slip features of this waffle bathtub mat make it a smart choice for children, elderly people or others who are at an increased risk for falls and injury while showering. It also adds a safe foot hold while you stand up after a relaxing bath. The mat is easy to maintain, and you can simply wipe the mat clean periodically to maintain its freshness. Besides the comfort is standing on the waffle mat while showering I particularly appreciate the safety it provides. Often the bottom of a wet tub becomes slippery and getting in and out can be a hazard however, the Cussioned Waffle Mat provides the security, comfort and peace of mind. It's nice to know your home is clean, but it's nicer to know your bathroom Mat is also Gem free. This Cushion Waffle Mat is soft, clean, and bacterial free. Once you place it down it stays in position, I love that feature, not to big not to small it fits the tub or shower just right. I love this in my bathtub. It's soft, clean and comfortable. This bathtub mat is nicely weighted which prevents it from slipping. Neutral color and easy to clean. The quality and price of this mat were a great deal, especially with Overstock's free shipping program. The last step in re-doing my second bath; while struggling to find towels and rugs in this bright and happy color, I was dreading looking for the bathmat. But no, it wan't a back-order and no I didn't have to wait! In fact I was totally surprised. This is such a happy color and whether spelled as Raspberry or Razberry I love it! The mat itself is larger than some found in the marketplace - perfect for a garden tub! Whether a Ladies Room, Powder Room or Your daughter's suite, this is a fabulous, happy and girly color! This bath mat is perfect! Secure no slip, feels great on my feet too. Low residue if any stays on the mat. No rubber smell. I highly recommend! I like the length of the bathtub mat. It makes it easy to position and the suction cups keep it in place. The only down side is I can tell where each suction is located. There isn't enough cushion between the suction cup and the bathtub mat. It is not very comfortable. Worrying about my mom falling in the shower, I was looking for a bathtub mat that I felt would keep her safe. I decided to buy this for her for Christmas, and I'm certainly glad I did. She loves it. A little piece of advice, just stick it to the shower wall to dry after use. Works great. Not as slip proof as most and is very hard to get it to stick down at first. Wants to float up in the tub but once its stuck its stuck good. The top of the mat is soft on your feet, however, the suctions cups underneath are made of hard plastic & are uncomfortable to stand on. It does a good job of staying where you put it, however, I wish the suction cups that hold it to the tub we more comfortable. I think next time I will try another type. I have not had it long enough to see how durable it is nor how well it keeps the mold at bay. I would not recommend this for someone who has sensitive feet. The mat looks fine but in my curved bottomed victorian claw foot tub, into which one must step up and over, I find the mat slips when I step into the tub, even with the rubber suction cups on the bottom. It's OK but not great. Much softer material than the standard rubber bath mat. This mat is so much better then the old one I had. It is very comfortable to stand on and sticks to the bathtub very well. I am happy with this purchase. The color I chose was a perfect color for a pink bathtub. It’s very important to buy something like this to prevent falls. Your feet feel like you’re on a rug and is so comfortable while taking a shower. Highly recommend. This bathtub mat is softer which is great since I have sensitive feet. At this time I don't know how well it will hold up but I am pleased with my purchase. Arrived as promised. So far ok. The mat is thick and comfortable. The suction cups appear to be too small in my opinion. Not so sure this will last very long. Cause my 3" hemoroids feel good on this mat with hot water running. Excellent medical treatment too. "How does this mat stick to the tub so it won't slip around?" Hello witzend688, this mat has suction cups underneath that hold the mat firmly in place. Thank you for shopping with us!